John Siblik created these wooden arches for Lockport. Passersby have noticed that wooden arches have popped up in the Illinois and Michigan Canal near Ninth Street in Lockport. 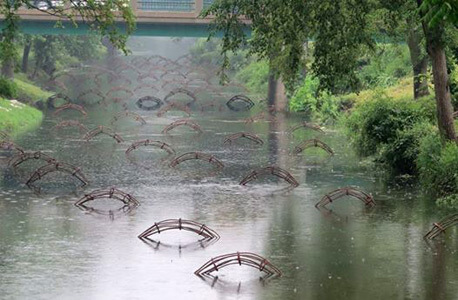 John Siblik, a Lemont native and alumnus of Northern Illinois University, banded branches together to make these 101 sculptures, which extend a half mile in the water as part of Lockport’s annual Summer Art Series. The free exhibits run through Aug. 17 at the canal, on the Lincoln Landing and in the Gaylord Building. This year’s theme is “Steampunk,” which combines combines fiction and fantasy with the steam power of the 19th century. Other artists have created an Abraham Lincoln sculpture, a rocket ship that children can explore and three-dimensional foam art. Siblik, who is the dean of the School of Liberal Arts at Upper Iowa University, first sketched the arch sculpture while he was an NIU student studying art education. He worked with the Illinois State Museum in Lockport to install the water art, called “River Weaving.” He will speak about how he created the pieces at 2 p.m. Sunday, July 27, at the site. Cranes, herons and ducks are expected to interact with the art, which will wash away over time. Alex Vietti has had artwork featured in the Midwest and is now making a name for himself in San Francisco. 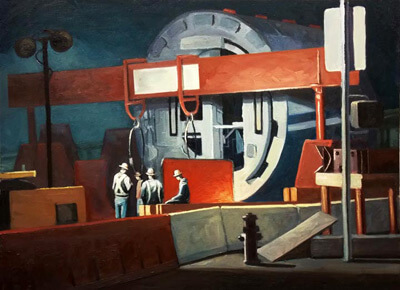 Alex Vietti, an award-winning artist, is showcasing his latest series of construction paintings through Aug. 27 at the Galleries of the Academy of Art University at The Cannery, 2801 Leavenworth St., San Francisco. The “Construction” exhibit showcases his realist series, which was created after he walked city streets and re-evaluated the work of construction workers. “Steadfast structures – the tall buildings, bridges, the houses we live in – give us a feeling of security needed to perform our daily tasks, to go to work, to live our lives,” said Vietti, whose artwork has been displayed at art galleries throughout the Midwest. An opening reception will take place from 5:30 to 7:30 p.m. Thursday, July 10, at which time Vietti will be available for questions about his work. He earned a bachelor’s degree in studio art from Northern Illinois University and a master’s degree in painting from the Academy of Art University in San Francisco. For more information about him, visit alexvietti.com. Operating hours of the AAU Galleries are available at aaugalleries.com. Tammy Kordik is making art contagious with her students. Tammy Kordik, an art teacher at Nelson Ridge and Nelson Prairie Elementary schools in New Lenox, has shown her students that art can be found at any angle, including where you sit. Kordik originally bought eight school chairs at a market as an art project for herself. But she ended up making it a service project for her fifth- and sixth-grade students from the art club at Nelson Ridge. 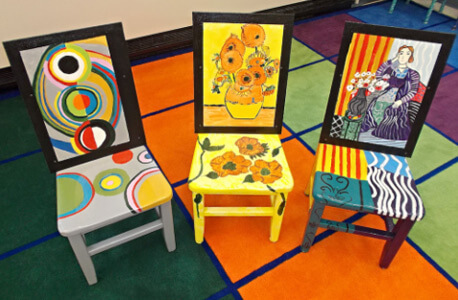 After designing and painting the chairs from last fall until this spring, the art club students showcased their work before a school assembly of 500 and then moved the chairs to the art room so younger students can use them to read about art history, Kordik told The Herald-News (Joliet) during a recent interview. After realizing that she enjoyed working with children, Kordik changed her major to art education at NIU and graduated in 1983. She is now working on a master’s degree in painting from Governors State University. To see the article on Kordik, visit theherald-news.com. “Art From the Great Wars, ” an exhibit of art and posters relating to World War I and World War II, will be on display through July 26 at The Art Box, 308 E. Lincoln Hwy. in DeKalb. 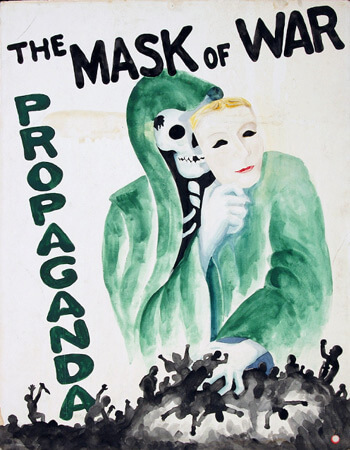 The exhibit illustrates the propaganda and horrors of war and honors artists who created thought-provoking images. John Wright, who majored in history at NIU, has provided the exhibit. He has collected war posters since 1970 and has amassed a collection of more than 1,000. Original poster art by Peter Helck, who illustrated for the Saturday Evening Post, and political cartoons from well-known artists Vaughn Shoemaker, Lute Pease and Jerry Doyle are part of the exhibit.